James Rosen spied on: His case is even worse than the AP reporters'. 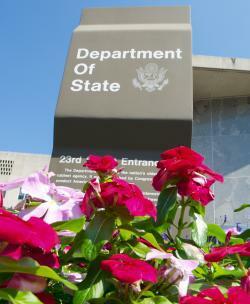 The 23rd Street entrance of the State Department in Washington, D.C. The Associated Press phone snooping scandal is still simmering. But now, adding fuel to the fire, another egregious example of the government spying on American reporters has been disclosed. The Washington Post reports that James Rosen, the chief Washington correspondent for Fox News, was subjected to intense government monitoring as part of an investigation into possible leaks of classified information about North Korea in 2009. The intrusion on Rosen was more severe than that of the AP reporters, whose phone call records were grabbed as part of a separate national security leaks investigation. According to court documents, two days’ worth of Rosen’s personal e-mails, documents, and attachments stored in a Gmail account were seized as were all his historic emails to a Yahoo account used by the alleged source, State Dept. security adviser Stephen Jin-Woo Kim. The feds obtained authorization to seize information showing Rosen’s communication with “any other source” related to the leak and also demanded Google turn over IP addresses and other metadata stored by the reporter’s Gmail account. In addition, investigators tracked Rosen’s movements to and from the State Department using security badge access records, and the timings of his calls with Jin-Woo Kim were traced. The Post notes that a federal judge approved a search warrant to seize the content of Rosen’s private emails on the basis that there was “probable cause” that the journalist was a “co-conspirator.” Google was ordered not to disclose the existence of the warrant, and it is not clear whether the company lodged any legal objections. (A spokesman for Google had not responded for comment at the time of publication.) An FBI counterespionage agent in an affidavit alleged that the reporter had broken the law “at the very least, either as an aider, abettor and/or co-conspirator.” This contentious reasoning appears to be grounded in the notion that any journalist receiving and publishing classified material from a confidential source is engaging in a criminal act—even although the U.S. government has never successfully prosecuted a reporter for disseminating unlawfully leaked classified information. The surveillance of Rosen will raise yet more questions about the extreme tactics adopted by the Justice Department’s multiple aggressive leak investigations. Last week, amid a storm of controversy following the revelation the feds had grabbed AP reporters’ phone records as part of a leak probe, Attorney General Eric Holder said he was “not sure” how many similar cases of snooping on reporters he had authorized. A number of top American journalists have commented in recent days on how draconian leak prosecutions and the practice of spying on reporters is damaging legitimate journalism, causing a chilling effect that prevents sources and whistleblowers from ever coming forward.